The Talinguru Nyakunytjaku viewing platform allows you to see for many miles. From here you’ll witness first light as it gently embraces the desert landscape. You’ll no doubt want to take advantage of the amazing photo opportunities that this experience provides. As the sun rises so too does the incredible bird life that calls Uluru home. Listen as the birdsong welcomes the new day and experience the tranquility of nature. Travel to the mystical 36 domes of Kata Tjuta. 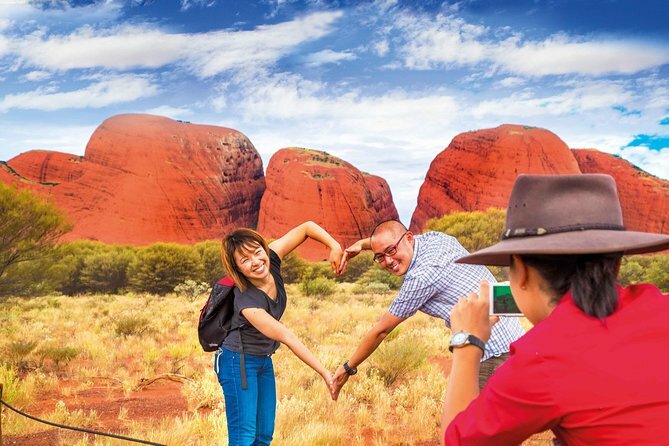 On the way enjoy panoramic views of the southern side of Kata Tjuta before arriving at the base of Walpa Gorge. Spend some time exploring the gorge and the unusual conglomerate rock formations. The walking trail through Walpa Gorge follows the natural creek between two of the tallest domes of Kata Tjuta.